Our cohort 2 researcher Athanasios Pouchias attend the Flow Processes on Composite Materials conference in Luleå Sweden from 30th May - 1st June 2018. The conference was arranged by the Luleå University of Technology and Swerea SICOMP AB. 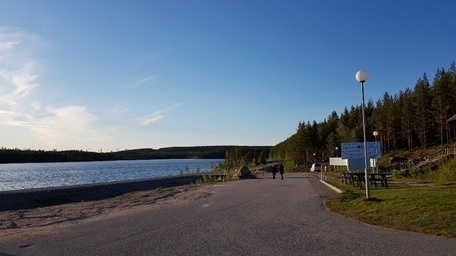 It took place in June 2018 in the small and beautiful northern city of Luleå, Sweden. FPCM 14 is part of a series of conferences covering the science and engineering of composites manufacturing. It provides a forum for scientists, engineers and designers from both academia and industry to exchange ideas, propose new solutions and promote international collaboration. Also, the conference covered topics from the challenges of graphene as a reinforcement to large-scale processing for composites with complex structures. “During the conference, I had the opportunity to present the work I had carried out during the first two years of my PhD studies. My research focuses on monitoring the Resin Transfer Moulding (RTM) process which is one of the most promising available technologies for manufacturing large complex three-dimensional parts from composite materials. The RTM process is mostly used in aeronautical, automotive and wind energy applications, such as the manufacturing of wind turbine blades. In this conference, I presented the design methodology for the development of a flow sensor which will be placed to monitor the RTM process.”The main interest of this FPCM conference was the determination of porosity and the characterisation of the permeability of fabrics. A special workshop on the permeability measurements was held during the second day where there was an open discussion on the current technologies and measuring methods for calculating the permeability of composite materials. The second day finished with an excursion to the Northern Arctic Circle. The Northern Arctic Circle is the ultimate place - from the North Pole - where the sun does not go down at summer solstice and does not go up at the winter solstice." Our Cohort 2 researcher Athanasios Pouchias attended the European Conference on Composite Materials (ECCM18) in Athends on the 24-28th June 2018. Athanasios was invited to give an oral presentation based on the conference paper he submitted. His presentation outlined the initial steps for the development of an online flow monitoring system for the Resin Transfer Moulding (RTM) process. The RTM is mainly used for manufacturing composite parts in medium volume production industries. This process is mostly used in aeronautical, automotive and wind energy applications, such as the manufacturing of wind turbine blades. The integration of a monitoring system to the process provides a better understanding of defects created during the process. ESCM is a European, non-governmental, non-profit scientific and engineering organisation. The society encourages the free interchange of information on all those aspects related to composite materials which is the interest to the scientific and engineering community. Also, ESCM promotes European co-operation in the study of topics in composite materials science and technology and liaison with engineering and scientific bodies throughout Europe with similar aims and to serve as a facilitator for communication between such bodies. The conference took place in Athens, Greece from 24 to 28 of June. It covered an expansive list of subjects regarding composite materials, nanodielectrics and their processing. More than one thousand publications were presented from both industry and academia. The conference divided into eight parallel sessions in four days. “The conference was very interesting as I could notice great interest on the composite materials manufacturing. I was fortunate to network with professionals who work on the “Industrie 4.0” concept and share my knowledge as the core subject of my research combines embedded intelligence with materials science and development. Our Cohort 2 student, Athanasios Pouchias, attended the NSIRC Conference 2018 in Cambridge which took place between 3rd-4th July 2018. The National Structural Integrity Research Centre (NSIRC) is a state-of-the-art postgraduate engineering facility established and managed by structural integrity specialist TWI. NSIRC unites academia and industry, working closely with lead academic partner Brunel University London and more than 20 other respected universities, as well as founder sponsors BP and the Lloyd's Register Foundation. The collaborating partners provide academic excellence to address the need for fundamental research, as well as high-quality, industry-relevant training for the next generation of structural integrity engineers. Robin Hamer from cohort 3 attended the Safety-II workshop following on from his previous FRAMily training. The Safety-II workshop was an additional 2 days after the initial 3 from the FRAMily meeting. It was the first of its kind and was a great success. There were a wide range of people present from different industries – including practitioners and academics. However, there were only 2 people from the nuclear industry, a theme that was apparent in the FRAMily meeting as well. I enjoyed listening to the various Safety-II related research lectures and it was good to see Safety-II principles being applied to many different industries. However, I still feel there is a lack of practical application and no one presented a Safety-II based tool – there was only classic qualitative research such as interviews themed around the principles of resilience engineering. In addition, there was still some discussion as to what Safety-II actually is, which I found surprising as the concept makes sense to me. It seemed that most people were coming unstuck with the technicalities of Safety-II rather than the bigger picture i.e. Safety-I and Safety-II are complimentary. Networking with other Safety-II enthusiasts was fun and my PhD seemed to pique the interest of a lot of the practitioners and academics as they were keen to find out how my PhD progresses and what I manage to produce. 1) How is risk assessed within your respective industry? The general consensus was that risk is still managed reactively i.e. we wait for something to go wrong then focus on this to identify and design out its presumed root cause. In addition to this, it was evident that behavioural safety is another focus whereby good behaviour is reinforced and bad habits are punished, removed or reduced. That is very much classical and operant conditioning, and this seemed to be a ‘fad’ according to conversations with people present. 2) What makes managing risk easy/difficult? It was agreed that managing risk is near impossible and that it is no longer easy to do. This is because socio-technical systems have gotten so large and complicated that we no longer know what is happening at any one time. This means that situations that may arise and eventually cause harm are latent, meaning that generally tiny random factors and precursors add up and eventually cause an accident/incident. At the moment, we are unaware of what these are and we are unable to identify them. Another theme that was made apparent was Work-as-Imagined and Work-as-Done. Feedback from conversations pointed out that the problem is what management think that workers do and what workers do are two completely different things. Therefore, knowing the general day to day work and processes that take place is impossible since there is a massive discrepancy between WAI and WAD. This is further complicated by the fact there are numerous other terminologies for what really happens and what people say happens e.g. Work-as-Prescribed and Work-as-Disclosed. This further complicated understanding what happens and capturing this is even harder. 3) What are the current main issues in your respective industry? Again, there was a theme with the answers here. It was generally agreed that Safety-II is the saviour – which isn’t surprising as it was a Safety-II themed week. However, it was also agreed that there is a problem with management. Comments were made that suggest that the workforce who participate in operations (on the ground) really buy into the idea of Safety-II and can see the benefit. However, it was clear that management believe that they were currently doing enough and there simply isn’t the time or resources for the incorporation of Safety-II within industries. I probed further to ask why this may be the case. Again, the theme was that it is not an organisational culture issue. It seems that management and those who have the power to implement these new principles and ideas are now older and inflexible in their approach to safety. For me, this isn’t surprising as there is still no evidence that I am aware which shows the benefits of Safety-II in a real-life case study. Therefore, it would seem that the issue is generational rather than cultural. Despite a few early adopters of the theory, the majority of management are still sceptical about Safety-II and therefore are unwilling to give practitioners and academics free reign to implement and develop methods, approaches and tools. 4) What challenges do they propose to the organisation? It seems that the issue with the Safety-II principle is that it is marketed in a way that allows people to make the assumption that Safety-II replaces Safety-I. In addition, to understand Safety-II you almost need to rewire your thinking of how accidents/incidents which isn’t easy especially if you have spent years understanding risk and safety in the classic Safety-I way. This provided a challenge, to introduce and communicate Safety-II to management and members of these organisations at a higher level in a way that makes them understand that we need this form of safety, but also to ensure that it is complimentary to Safety-I. I believe this is by ditching the terminology Safety-II and using other more attractive words. People agreed with this and some examples are: ‘Golden Days’, ‘The Art of Work’, ‘Mastering HFE’. 5) What are the main fresh ideas emerging within your respective industries? Since all suggestions were based around Safety-II and Resilience Engineering I will name and discuss them in the context of Safety-II. It was clear that Safety-II needs to be quantified in some way. Since FRAM – Functional Resonance Analysis Method was main theme of the week, it was interesting to see how this could be quantified using a Bayesian Network to give a likelihood or something going right or wrong in a system based on how important a system component is and how dependent other components are on it. This was interesting as in many different scenarios, a probability can be gained and therefore a 'what if?' question can be quantified. Therefore, it is vital that there is a need for a tool/instrument that has Safety-II and Resilience Engineering principles and moreover, interventions that can be used to reinforce or reduce desirable or undesirable actions/behaviours in everyday work. 6) Is there a need for a new method/tool/instrument? Strangely enough, people did not think there was a need for a new tool or instrument. I disagree though as I definitely think there is an opportunity for a new tool/instrument from more of a practitioner standpoint. People were quite fond of the FRAM method and thought that could be adapted for use in industry. However, I do think the FRAM method is more an exercise for academics and is not fit for use in industry as a main tool. This is because the FRAM essentially is a tool that identified weaknesses and vulnerabilities in a system which provides that opportunity for discussion. Also, FRAM and the interviews that are needed along with the analysis take a lot of time. Despite this, people thought that FRAM was awesome and quite often, discussion was steered towards how great FRAM is all the different ways how it can be used. I believed though that there is a need for a new method, tool or instrument that can be used alongside FRAM. Robin Hamer from cohort 3 participated in the 2018 FRAMily tutorial and workshop in Cardiff. This tutorial and workshop took place in Cardiff School of Engineering and is an annual occurrence in Resilience and Safety-II academics, practitioners and industry. This particular tutorial and workshop concerned a method for analysis complex socio-technical systems called FRAM – Functional Resonance Analysis Method. In the past I have tried to read and apply the information in the books concerning FRAM. However, I found that without instruction and due to the complexity of the method, it was very difficult to implement without guidance. Therefore, the first day proved to be very useful as we went back to basics and learnt about the logic behind the method and how it is used. In addition, we were introduced to an open source computer program which would allow me to create and edit FRAM models easily. Over this day, I gained a basic understanding about how the model worked and how to create my own models. On the second and third days, presentations were given by various academics and practitioners. These were mainly either how FRAM was applied in practise, using FRAM in case studies or mixing FRAM with other methods to quantify the outputs. I found these two days slightly overwhelming in terms of knowledge. I thought I had just had a grasp of FRAM but some of the work that was being done with the model really was complicated and it was clear that FRAM has many applications. One presenter had even used FRAM to model the human brain, which I thought was amazing conceptually. All in all the talks were very good and the questions were stimulating, however, I still have my own reservations about the method. There was little concrete evidence of how you get from the model to spotting weaknesses in the system to then providing interventions. Although this may be obvious to experienced FRAM users, it was not made obvious over the course of the three days. I can see some use of FRAM within my PhD in a sense that it would be good to model work-as-imagined and work-as-done of the tasks I wish to improve using my tool. I feel that by using the tool I will adapt and FRAM together may provide a comprehensive understanding of the tasks and problems within the nuclear industry. To summarise, I thought the three days were very useful and have given me new ideas for my PhD. However, I still have some reservations about FRAM: it's too complicated and time consuming. Whilst I see value in an academic exercise, I see little use in using FRAM solely for this PhD since it is industry focussed. However, I do see use in FRAM in addition to another tool/instrument. I also managed to network and briefly and informally ask some of my potential interview questions to numerous people. The results weren’t surprising but it was good to see people across various industries all saying the same thing. In April 2018, our cohort 1 researcher Dimitrios Pantazis attended the 6th AnyLogic Conference in Baltimore, US. The AnyLogic (https://www.anylogic.com/) is a multimethod simulation tool, which provides the opportunity to end-users to experiment with discrete event, agent-based and system dynamics modelling. The flexibility of combining these different simulation methods under the same environment and the ease of extending the embedded libraries via Java to fit the user needs have established AnyLogic as the go-to solution in many sectors, such as automotive, healthcare and oil and gas plant engineering. The purpose of this 2-day annual conference was to demonstrate the new capabilities of the software and also give the opportunity to the audience to expand their horizons by real case studies from industry experts like Intel and researchers from world-leading universities such as the National University of Singapore. The attendees had the chance to gain insight and engage into discussions about active research topics such as the smart factory and digital twin modelling for the Industry 4.0 (presentations by FairDynamics and decisionLab), simulations of autonomous vehicles impact on road networks (presented by the Boston Consulting group) and integration of AI into simulation modelling (presented by PwC), only to name a few. The conference was accompanied by three workshops, one of which was delivered by Dr. Andrei Borshchev, CEO of the AnyLogic Company. 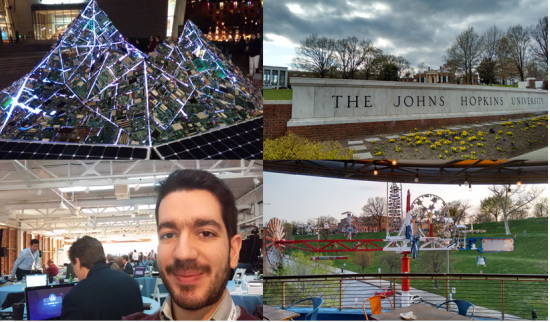 As part of his trip, Dimitris also had the opportunity to visit the Johns Hopkins University and also experience the third annual Light City festival (https://lightcity.org/). 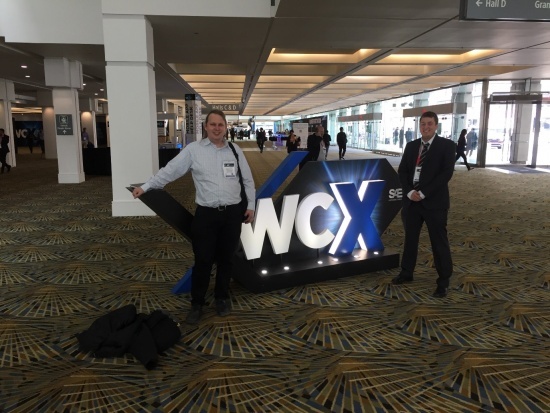 In April 2018, Rhys Comissiong from Cohort 2 attended the Society of Automotive Engineers World Congress in Detroit, Michigan, US. The conference was held over 3 days from the 10th to the 12th at the Cobo Center. The conference consisted of technical sessions, keynote speeches and an exhibition; which included exhibits from the top automotive manufacturers including GM, Toyota and Ford. The technical sessions were divided into 6 key areas: Body and Pedestrian Safety, Advanced Powertrain, Materials, Emissions Management, Design and Automotive Electronics/IOT/Connectivity. On the Wednesday, Rhys presented a ‘Review of Selection Criteria for Sensor and Actuator Configurations Suitable for Internal Combustion Engines’ which was co-authored by his supervisor Dr Thomas Steffen. The paper assessed the different criteria that went into selecting the right sensor and actuator configurations for an engine. The key finding was that a tool was required to evaluate the control architecture, and this would be beneficial to the other industries in addition to the automotive sector. The presentation was well received with a good turnout in the Sensor and Actuator technical session. Outside of the presentation Rhys attended a range of talks by expert panels including the future of prognostics and diagnostics and Blockchain and IOT. There were also several opportunities to network including a careers fair with a range of employers in the automotive sector such as Hitachi, Denso and Tesla. With recent developments in autonomous systems and electrified powertrains, the conference provided a great insight into the current and future state of the automotive sector globally. View of Detroit, Michigan, US from Windsor, Ontario, Canada. 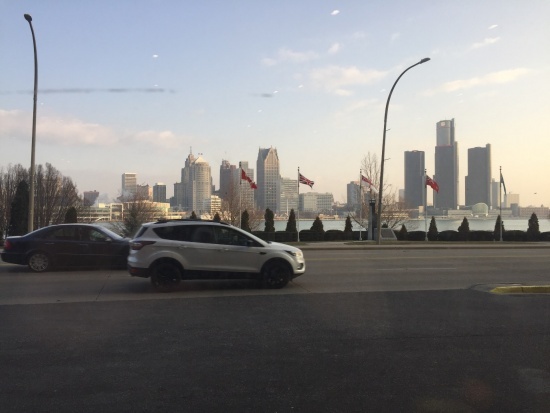 During the conference Rhys stayed in Windsor, Ontario, Canada and spent time with other Loughborough Academics and PhD students whilst trying out the local restaurants. 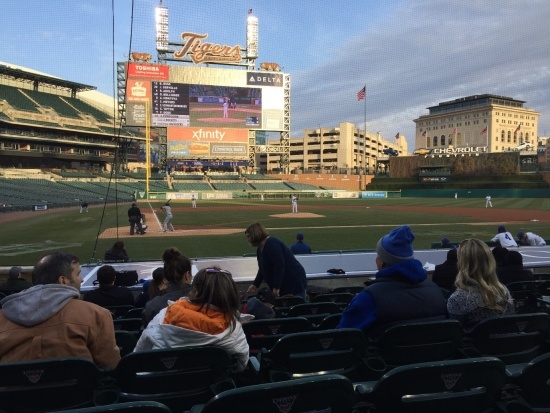 After a journey to find a hat as a souvenir he found himself in a college baseball game at the Detroit Tigers Stadium, which was more entertaining than Cricket! For the second year running the CDT-EI has been represented at the annual Loughborough University Postgraduate Awards. 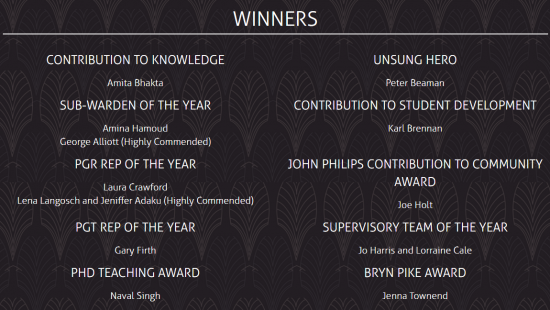 Cohort 1 researcher, Joe Holt, was nominated by his peers for the John Philips Contribution to Community Award, which recognises the impact and efforts of a volunteer(s) who has given much of their own time to improve the postgraduate experience at both campuses by creating a close-knit and supportive postgraduate community. On collecting his award Joe said "I was both honoured and surprised to win the award knowing some of the other nominees I was up against. It was great to have my volunteering as part of the PhD Student Support Network recognised on a personal level but also for the Network as a whole. The award is a lovely addition to the rest of my experience here at Loughborough University."